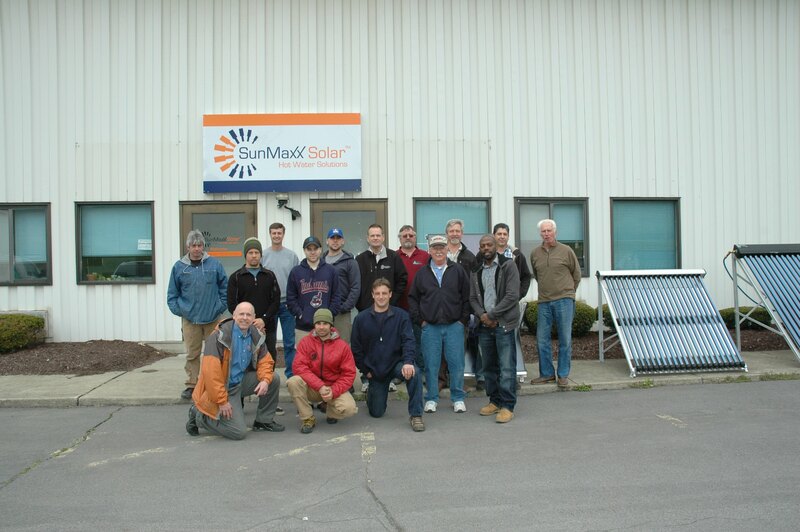 FOR IMMEDIATE RELEASE – May 7, 2012– Binghamton, New York – SunMaxx Solar, a leading integrated manufacturer of solar thermal systems and components, is pleased to announce that the company has opened its new solar training facility in Binghamton, New York. The creation of this facility is part of SunMaxx’s continuing effort to make the company’s solar thermal training one of the best in the industry. The 2,000 square foot indoor, training lab was designed with a presentation area and a separate large open space for hands-on system component installation. Lead by SunMaxx educator John Maliwacki, training takes students through the science, installation, and marketing of domestic and commercial solar hot water systems, all in a comfortable rain-or-shine atmosphere. The SunMaxx Solar training facility provides accelerated training classes for contractors, electricians, engineers, solar energy entrepreneurs, sales executives and anyone who is considering a career change in the growing solar industry. SunMaxx solar training programs are structured to help individuals and licensed contractors get into the solar industry and excel in the solar job market. The hands-on courses in Solar Hot Water and Photovoltaic (PV) system design and installation help train students to meet the requirements of launching a solar installation business or finding green jobs. Solar energy technology is evolving fast, and SunMaxx Solar’s new facility is just part of the company’s commitment to teach cutting-edge technologies. On a commercial solar scale, the new facility supports up to five Solar Hot Water training courses per month and two PV training courses per year. For a schedule of upcoming training opportunities please visit: www.trainingsolar.com. For more information about how to sign up for training email marketing@sunmaxxsolar.com.